New interior and exterior sign and brand identity package at the University of Utah facility completed. Salt Lake City, Utah−December 17, 2015−YESCO recently completed a brand identity package at the Jon M. and Karen Huntsman Training Facility located on the University of Utah campus. The overall construction project includes new construction and renovation totaling 80,000’, complete with two full-sized basketball courts. The center will set a new standard in collegiate sports. 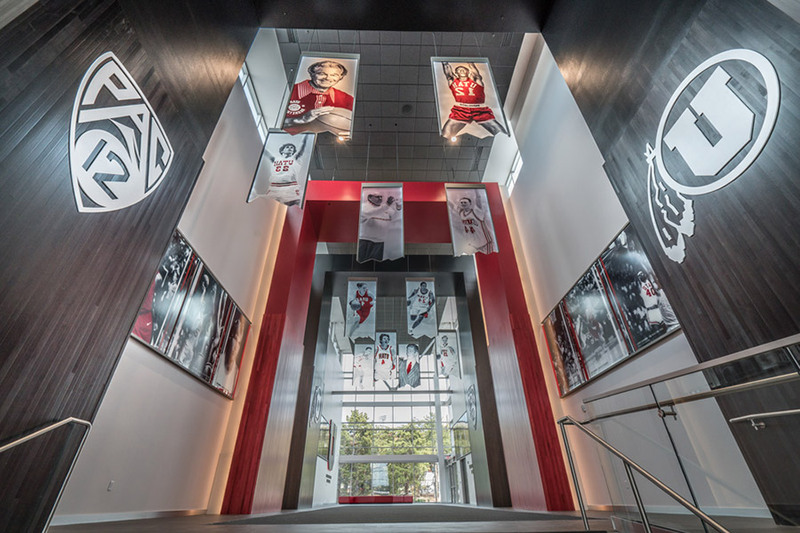 Ann R. Argust, University of Utah Associate Athletic Director, was involved in the entire project and refers to the facility as beautiful in its own right. “Adding the signage and branding just elevates our facility to the best in the Pac-12 and top rated in college basketball. 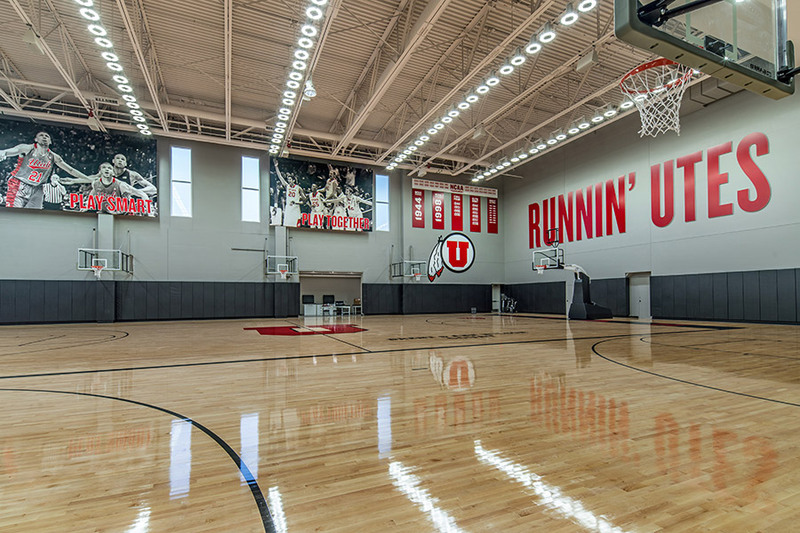 I can’t say enough about the detail, craftsmanship and dedication of the YESCO team to make the Jon M. and Karen Huntsman Basketball Practice Facility the gem of our campus,” she said. “The University project was a great opportunity for YESCO to fully demonstrate its range of capabilities. From fabrication and installation of the small block U pull handles in the men’s locker room, to the 28’ tall interior drum and feather logo in the Legacy Hall, YESCO’s passion for creating unique signs will be on display for generations to come. This project showcases the company’s ability to bring a customer’s vision to life,” said Aaron Green, YESCO project manager. “It’s a beautiful facility. The signs are phenomenal. The YESCO team knocked it out of the park. I couldn’t be more pleased with results. We worked together to ensure the project was finished in time,” said Chris Ohpar, Superintendent of Okland Construction. 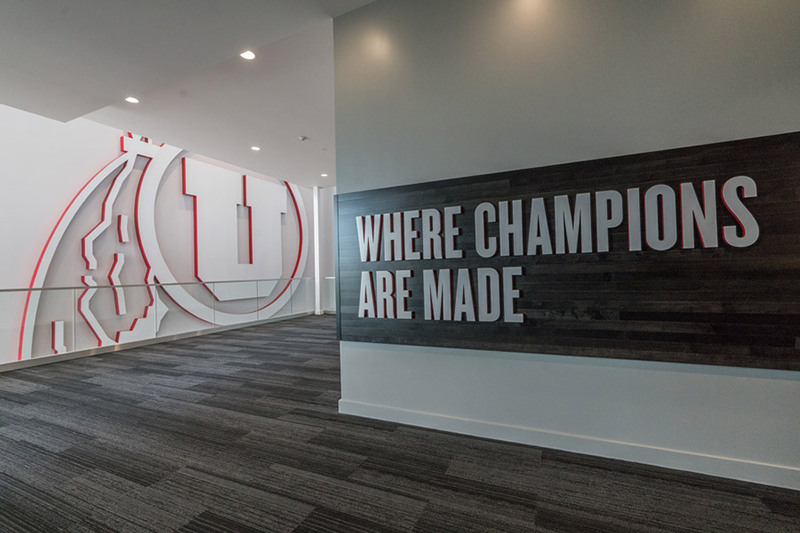 “I have great love for the University of Utah Athletic programs and this was one of the most exciting projects of my career with YESCO,” said Kevin Christensen, Account Executive. 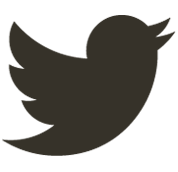 About YESCO: Thomas Young founded Young Electric Sign Company (YESCO) in 1920 in Ogden, Utah. The company operates a full service custom sign manufacturing business offering creative design, engineering, leasing, financing, and maintenance agreements. YESCO owns and operates its own network digital of billboards as well as 1,800 traditional billboard faces in the Western United States. YESCO operates a sign and lighting service franchise network throughout North America. For more information about YESCO click here. The annual YESCO Sign & Lighting Service Convention will be held January 13-16, 2016 at the Luxor Hotel and Casino in Las Vegas, Nevada. All of our franchisees are invited and encouraged to attend. Contact Nate Young for details – nyoung@yesco.com. 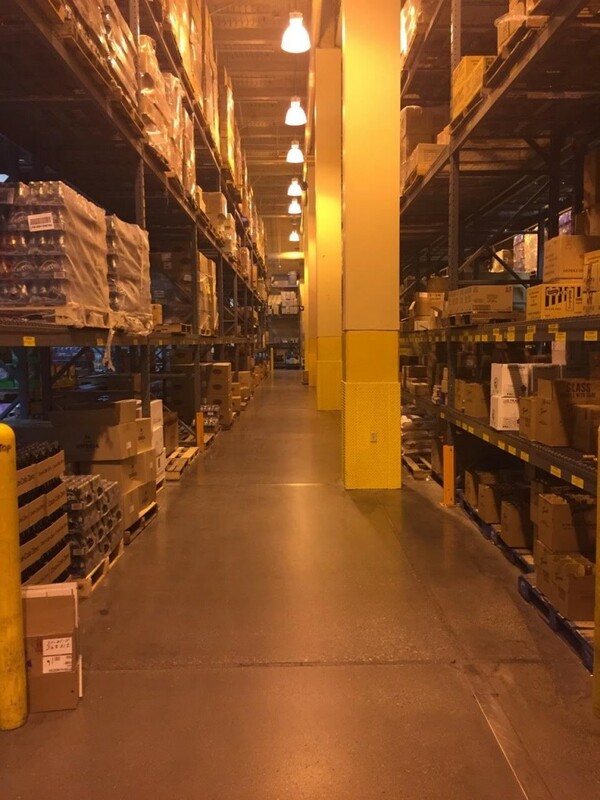 A team of YESCO service and lighting experts recently completed a warehouse retrofit for the Bellagio Resort & Casino in Las Vegas. The project is one of two properties awarded to YESCO from MGM Resorts International to upgrade existing lighting systems in warehouses and dry storage facilities. “It took awhile to to get used to it but the lighting is brighter and more even. More importantly, it is easier for the forklift drivers to read packaging labels,” said Will Parks, Bellagio Warehouse Manager. The 1950s came alive with color-neon color. Las Vegas mushroomed into the most razzle-dazzle city in the world. The term “spectacular sign” took on new meaning. In 1959 a massive sign was designed, manufactured and installed for The Mint Hotel and Casino. It was acknowledged as the electrical engineering classic sign of its time. This majestic curved and arched form towered 96’ above “Glitter Gulch” as Las Vegas’ Fremont Street came to be called.